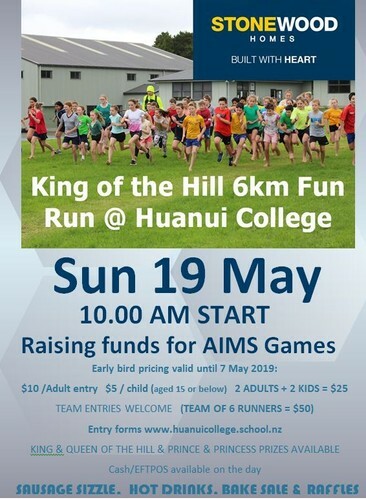 Bring your friends or family and take on the Huanui Hill 6km challenge! Perfect for school/Whangarei/Northland Champs/AIMS Games cross-country training, and just to have lots of fun! Baking, sausage sizzle, and quickfire raffles on the day plus trophies for our King, Queen, Prince, and Princess winners. Prices for entries received from 8 May onwards. - 10:30 am – please be at the event between 9:30 and 10:00 am for final registration. - Toilets are located by our college sports gymnasium. - Due to the nature of the course, no wheeled conveyances (e.g. roller blades, cycles, scooters or skateboards) are permitted in this event. We would not recommend the course to any person who requires wheelchair assistance due to the nature of the course. - Treat all fences as live due to surrounding livestock. - Where there is a lane coned for participants, you are required to remain within the cones at all times (keep the cones on your right). - Take extreme care when passing other participants. - Marshals will be wearing high-visibility vests and are there for your safety. Follow their instructions and those of the event organisers at all times. - If assistance is required please stop and wait for the tail marshal, or notify the nearest marshal. - No animals (except guide dogs) are permitted to accompany participants during the event. - This is a cross country event involving waterways so please wear appropriate footwear. - Prize giving will be held after the last runner has completed the course. - Participants must be present at prize giving to claim their prize. - As this event focuses on the fun aspect so many of you enjoy, no times will be recorded and only the first Prince, Princess, King and Queen finishers will be acknowledged at prize giving. In the unlikely event of cancellation, notice will be posted on the Huanui College Facebook page and website. Where possible attempts will be made to email participants who have supplied an email address with their entry. While we will endeavour to make a decision to cancel the event as early as possible, situations can occur quickly and without warning close to the start of an event which means we may be unable to communicate with you directly in advance.